The 2018 Retail Offer has now closed. We periodically make offers to wholesale investors. Please add yourself to the mailing list or otherwise get in touch if you would like to know more. Punakaiki Fund’s total assets, including cash, were valued at $40.6 million on 24 September 2018 for the October/November 2018 PDS. The Investor Net Asset Value (iNAV), after all liabilities, including long term contingent liabilities for Performance Fees, is $38.4 million, or $21.22 per share and the PDS Offer has a price per Share of $21.50. This is an offering of Ordinary Shares in Punakaiki Fund. The Price per Share is $21.50, and is inclusive of 3% brokerage. Once you pay for your Shares, you will have no obligation to pay any further amount. Additional information regarding the management of Punakaiki Fund is contained within the Management Agreement between Punakaiki Fund and LWCM, found in the Disclose Register under Punakaiki Fund’s offer number (OFR12491). Punakaiki Fund Limited is not a ‘managed investment scheme’ (MIS) for the purposes of the Financial Markets Conduct Act and does not have an FMA-licensed manager or an FMA-licensed independent supervisor to govern its investment activities. Investor rights are set out in the constitution of the company, which has been set up in accordance with the Companies Act 1993. Under its constitution, Punakaiki Fund is structured as a company and is governed by a shareholder-elected board of directors, with the Manager appointed under the Management Agreement. The investor rights include the ability for the Manager to be removed without penalty if a majority of Shares are voted in favour of doing so. A typical MIS requires approval of 75% of its investors to remove the scheme manager. The Portfolio Companies represent a diverse range of products and services, target markets, business models and sizes. 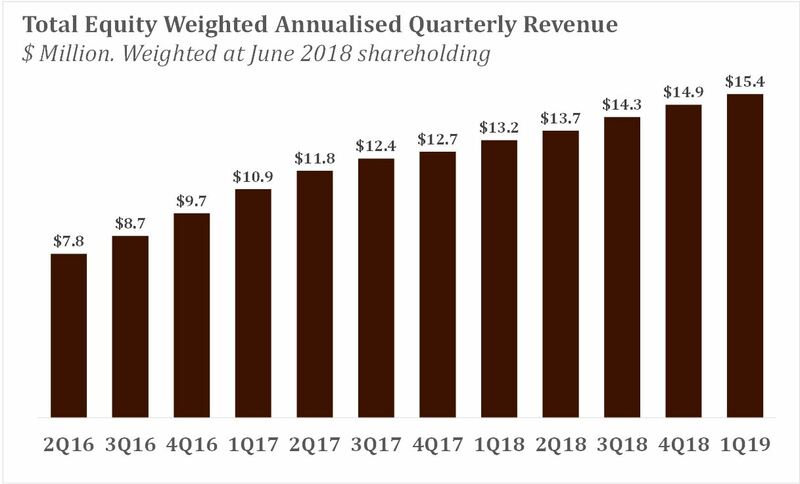 The aggregate annualised last-quarter (June 2018) revenues for all companies was almost $100 million. The equity-weighted revenues totalled $15.4 million, and the chart below shows the increase in total equity-weighted revenue for all Portfolio Companies over the past 10 quarters. The charts below reflect the investments in the 18 companies, as valued for the PDS on 24 September 2018. Linewize and ThisData have been excluded as they are in the process of being sold. They show percentages of total investment value, excluding cash. any dividends paid to investors by Punakaiki Fund. No dividends have yet been paid, none are currently proposed and none are expected to be paid in the short or medium term. The value of our Assets is primarily driven by the change in financial performance (and therefore valuation) of each of the Portfolio Companies in our portfolio, in particular their revenue growth and profitability. The value of our Assets is also driven by any dividends paid to Punakaiki Fund by Portfolio Companies and by the costs incurred by Punakaiki Fund. each Portfolio Company’s ability to raise additional capital, some of which may be provided by Punakaiki Fund. The key drivers of Return are discussed further in Section 6, Key Features of the Shares, of the October/November 2018 PDS. Investments in shares are risky. You should consider if the degree of uncertainty about Punakaiki Fund’s future performance and returns is suitable for you. You should also consider whether the price of these Shares fairly reflects the potential returns and the particular risks of these Shares. Punakaiki Fund considers that the most significant risk factors that could affect the value of the Shares are set out below. Loss of value due to the poor performance or failure of one or more of the Portfolio Companies, which would cause the value of the investment assets of Punakaiki Fund to be revalued downwards. The Manager actively monitors performance of the Portfolio Companies and Punakaiki Fund marks down the carrying value of any underperforming investments. To date, investments representing 54% of the value of the investment assets of Punakaiki Fund have, at some time, been marked down from a previous carrying valuation. The investments we currently regard as highest risk are valued at under 7% of the Investor Net Asset Value, which is the value of the Assets less liabilities and less the share-based component of the accrued Performance Fee. Higher volatility in the valuation of Punakaiki Fund investments than in public market indices. This reflects the heightened valuation volatility that the Portfolio Companies have in response to public market valuation movements (e.g. downwards and upwards movements in the ASX, NZX and international share market indices) due to their smaller size and higher growth. For clarity, a sudden 30% fall or rise in global share markets would likely result in a greater fall or rise in the valuation of Punakaiki Fund’s investments. We maintain a very long-term perspective on investments, which can make us less sensitive to some short-term volatility. Ongoing capital raisings (such as Share issues) do not meet Punakaiki Fund’s needs or expectations. Punakaiki Fund requires cash to meet its operating expenses and to make further investments. If Punakaiki Fund does not continue to raise sufficient capital or sell investment assets including any listed shares it holds then it may fail, in which case the Investor Net Asset Value per Share is likely to fall significantly. We set aside a reserve of 2.75% of Accounting Net Asset Value immediately after any Punakaiki Fund capital raising event to meet our operating costs over the following 12 months and in addition have successfully raised $24.5 million in cash since April 2014. We also hold “performance” shares in an ASX-listed company that will be able to be sold once certain milestones are achieved. 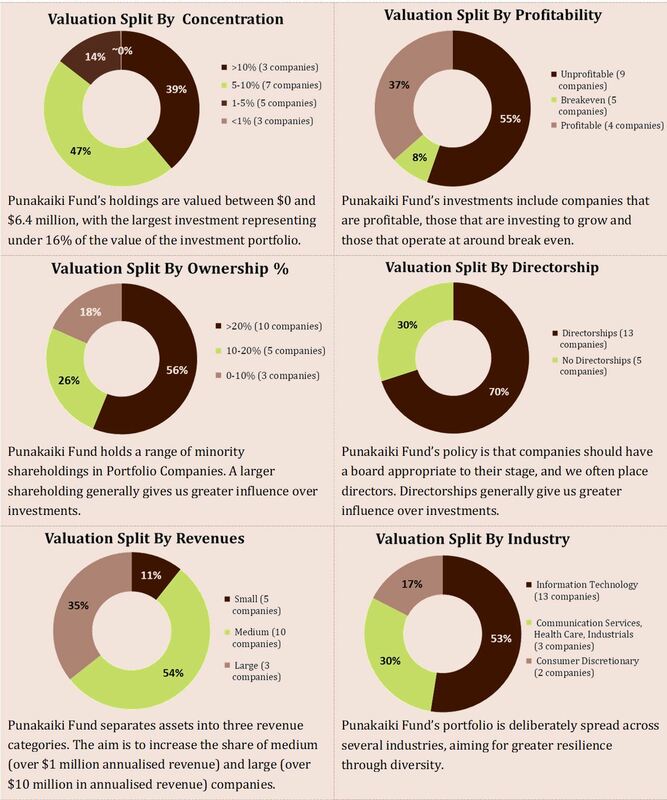 High concentration of investments in technology businesses gives Punakaiki Fund greater exposure to technology sector volatility, with the risk that a downwards valuation in the entire technology sector could have a more significant impact on the valuation of Punakaiki Fund’s portfolio of investments than on a more diversified portfolio. We invest in companies which provide us with exposure to a diverse range of industries to help mitigate our technology and SaaS business model concentration. Uncertainty about the valuation of companies, with the risk that the valuations could be too high or too low versus market values. Punakaiki Fund’s auditor Ernst & Young draws attention in their Independent Auditor’s Report on the FY2018 financial statements to “Note 3.1.1 to the financial statements describes the inherent uncertainty and difficulty in measuring the fair value of early stage unlisted investments”. Punakaiki Fund uses revenue, EBITDA, revenue growth rates and public market valuations of comparable companies; along with performance, small company, control and liquidity adjustments, to guide periodic valuations of the portfolio. Punakaiki Fund also uses valuations provided by external providers, and also investment metrics of publicly listed shares. The loss or the poor performance of key people, specifically Lance Wiggs and Chris Humphreys from LWCM, the Manager. The Management Agreement can be terminated by the Board for cause, and by Shareholders with a majority vote, each without penalty. This summary does not cover all of the risks of investing in Shares. You should also read Section 8 of the October/November 2018 PDS, Risks to Punakaiki Fund’s Business and Plans, on page 49. Punakaiki Fund makes long-term investments into high-growth, revenue-generating New Zealand companies. The company has a diverse portfolio of investments in 20 Portfolio Companies, of which two are held pending exit, and total assets, including cash, of $40.6 million. The remaining 18 Portfolio Companies represent a diverse range of products and services, target markets, business models and sizes. Their aggregate revenues over the twelve months to 30 June 2018 (not weighted by our shareholding) were $93 million, while the largest individual investment represented less than 16% of Punakaiki Fund’s Assets. Punakaiki Fund predominantly generates returns through changes in the fair value of our investments (net of accrued Performance Fees), as well as dividends received from investments and cash or shares received from the sale of investment assets. To date the company has negative operating cash flows, as cash spent on operational expenses exceeded cash received from dividends. Net cash of $0.468 million was used in operating activities for FY2018. Punakaiki Fund has a target asset allocation immediately after fund-raising of more than 2.75% of its assets to be held in reserve as cash (currently $1.691 million) to ensure that the company can meet operational costs for 12 months without further fundraising. Our Statement of Investment Policies and Objectives, summarised below, outlines the philosophies, objectives and strategies we have in place to in order to make investments and deliver returns to our Shareholders. We believe these philosophies, objectives and strategies are an effective and appropriate way to maximise returns for our Shareholders. New Zealand Focus: We believe that there are consistently large numbers of high quality New Zealand-based companies seeking funding, but that there is a general shortage of well-directed growth capital. We also believe that there are exploitable market inefficiencies for the supply of growth capital in New Zealand. High Growth Focus: We believe that well-selected high-growth companies can generate risk-adjusted returns for our investors that are higher than those from public markets. Investor of Choice for Founders: We believe that a founder-centric approach to investment and management attracts the best high growth investment opportunities to Punakaiki Fund. Attractive Portfolio: We believe that holding a highly regarded portfolio of investments attracts other highly regarded companies to seek investment from Punakaiki Fund. Long-term Investment: We believe that holding investments for the long-term delivers higher returns to our investors. Diverse Portfolio: We believe that portfolio diversification reduces the level of risk for a given amount of return. Punakaiki Fund has a primary objective of delivering Shareholders significant returns over the medium to long-term. We aim to deliver significant five-year rolling annual returns to Shareholders, measured net of all costs, fees and Punakaiki Fund-level taxes. We believe that strong returns are achievable based on the underlying growth rates of the Portfolio Companies and new companies that we invest in. We also believe that this value will manifest providing that we continue to hold those companies over the long-term, and we will reinvest into companies with this perspective. Value may also be delivered through the sale of our investments. We aim to be able to eventually meet our internal expense obligations (including the payment of the Management Fee) through dividend flows from Portfolio Companies, rather than by raising new capital. We aim to find high-growth companies in New Zealand and support them with capital and advice (as required) and be easy to work with for founders. We do not insist on board seats, complex contracts or control when investing, but do look for appropriate governance and will take directorships when desired by both parties. We are able to act swiftly where required to agree and close investments, in particular follow-on investments. a robust financial investment case that allows the company to grow or return to positive cash-flow with investment. We are a permanent capital investor and have a patient, long-term investment mandate. We aim to hold our investments for considerable periods of time in order to allow our Portfolio Companies to grow to maturity. Occasionally we may sell investments, although generally only after a founder-led decision. We aim to lower Punakaiki Fund’s market risk by having a well-diversified portfolio across company stages, industries, business models and markets. We aim to hold Portfolio Companies over the long-term to receive ever-increasing dividend payments. Many venture capital funds use gross internal rate of return (“Gross IRR”) as a measure of their performance. Gross IRR is the annualised percentage return from each investment, based on the amount invested, the elapsed time between the investment date and today, and today’s valuation of that investment. For example, if an investment of $1 million was made in July 2017 and the value today was assessed at $1.5 million then the valuation would have increased by 50%, but the gross IRR, which is the annualised percentage return, would be only 38% (i.e. the compounding annual return that you we need to receive to grow $1 million to $1.5 million over 15 months). 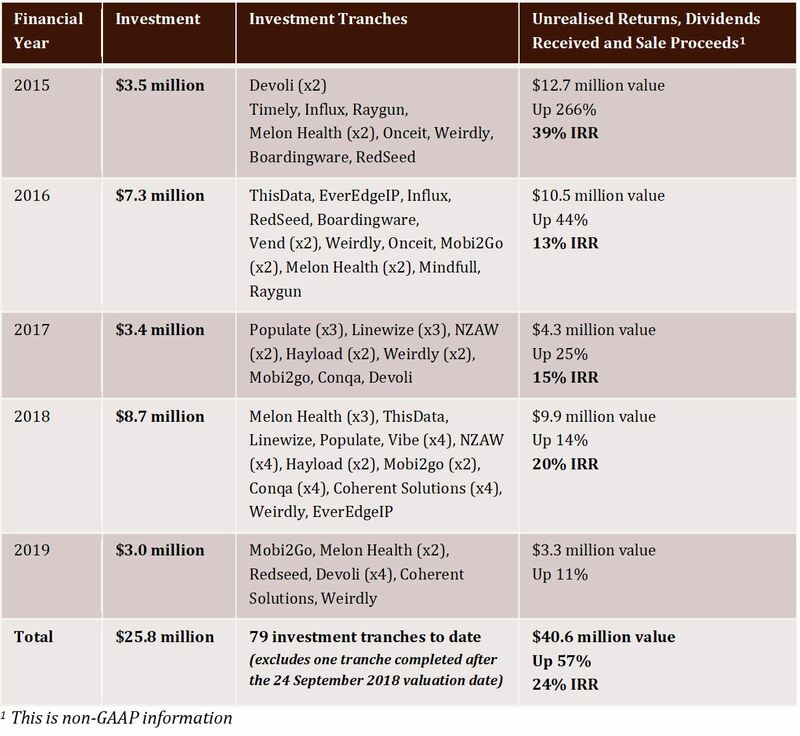 The table below reflects the overall gross IRR of our investments, grouped by the calendar year of each investment tranche into Portfolio Companies that we have made. This excludes all fees and other operating costs of Punakaiki Fund and also excludes brokerage paid by investors. Punakaiki Fund’s investments have delivered a Gross IRR of 24% (a 58% increase in value) based on assessed changes in fair market valuation, as well as dividends received, since each investment tranche was undertaken. In general we expect investments in Portfolio Companies that Punakaiki Fund has held and provided advice to the longest will show the greatest returns, while the newer investments take time to be materially revalued. The strategy of Punakaiki Fund is to hold investments for the long-term and to reinvest where prudently possible. The approach to valuation is discussed in Section 5, Terms of the Offer, on page 37 of the October/November 2018 PDS. In May 2018, Punakaiki Fund raised $1.712m by issuing 81,530 ordinary Shares at $21.00 each. 80,283 Shares to seven EverEdgeIP Global Limited shareholders to the settle the acquisition of EverEdgeIP Global Limited shares in February 2018 (this issue of shares also included raising $0.017m in cash subscriptions from those shareholders); and 71,908 Shares to two Devoli Limited shareholders to the settle the acquisition of Devoli Limited shares in September 2018. © 2013–2019 Punakaiki Fund Limited.